Business leaders need to constantly look out for ideas to accelerate their company’s growth, improve customer satisfaction and identify new revenue streams. They may have heard about cognitive computing but aren’t sure how it can help address their business challenges. The IBM Watson Business Coach, an executive-sponsored project, is a first-of-its-kind interactive tool designed to help clients discover how cognitive computing can help them overcome their biggest business challenges and gain competitive advantage. 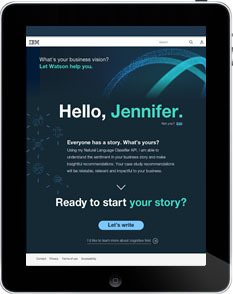 Featuring a voice-enabled conversation with Watson as the guide, users can share their business story to receive a personalized roadmap as well as inspiration from real client success stories of cognitive implementations and outcomes. Assets included an interactive tool, powered by Watson, an iPad app, a clickable animation, social graphics, and presentations. My role was Content Marketing Lead / Producer, Creative Director and Solution / Data Designer. Quantum computers promise exponential leaps in speed and power over what is attainable by traditional computers today. Harnessing such capabilities would accelerate innovation across industries and the world, providing companies with extraordinary advantage in areas as diverse as pharmaceuticals and encryption to weather forecasting and large-scale modeling. In partnership with IBM Research, the IBM Center for Applied Insights interviewed experts in the quantum computing to learn about the latest breakthroughs in the field and the business benefit across applications and industries. Assets included a white paper/ebook, infographics, social graphics, expert videos and a presentation related to the research. My role was Content Marketing Lead / Producer. As mobile apps take center stage, development teams face enormous pressure to continually adapt to changing technologies and user expectations. How do some mobile development projects succeed when most don’t? According to an IBM Center for Applied Insights study involving 585 mobile development professionals, the secret lies in having both the right team and the right approach. Assets included a white paper/ebook, infographics, social graphics, an interactive quiz game and a presentation related to the research. My role was Content Marketing Lead / Producer and Creative Director. The number of companies focused on social capabilities had more than doubled and most executives recognized the potential of social technologies. Yet only 20% believed their organization was acting truly social. Based on a cluster analysis of 19 social capabilities deployed by more than 370 organizations, this IBM Center for Applied Insights study found that the pioneers are evolving by deploying five distinct clusters of capabilities, known as social ambitions – each aimed at realizing a specific goal. Assets included a white paper/ebook, video, infographics, social graphics and a presentation related to the research. My role was Content Marketing Lead / Producer and Creative Director.